Hyperthyroidism is a common endocrine condition affecting cats. The condition involves the over-production of hormones from the thyroid, which, in turn, increases the body’s metabolic rate. This has implications for the entire body and prompts a number of changes. While cats of all ages can develop Hyperthyroidism, it is most prevalent (almost exclusively so), in older animals of 10 years+. Less than 6% of cases occur in younger cats and the average age of onset is 12 years. It is estimated that 5-10% of older cats will develop Hyperthyroidism as they age. Because the condition increases a cat’s circulating levels of hormone and thus heightens the metabolic rate, left untreated, Hyperthyroidism can make a cat seriously ill and may even lead to heart and kidney failure in some extreme cases. High concentrations of thyroid hormone interact with a number of bodily functions, as well as stimulating the central nervous system (CNS), which may lead to behavioural problems as well as hyperactivity and restlessness. What are the signs my cat has Hyperthyroidism? If you suspect Hyperthyroidism, it is probably because you have observed one or more changes in your cat. Clinical signs can be quite dramatic and you may wonder what on earth has happened to your pet in such a short space of time. The most common symptom of Hyperthyroidism is weight loss, which is seen in 95% of affected cats. This often strikes cat owners as strange as most cats will have an increased appetite that is at odds with their continual weight loss. 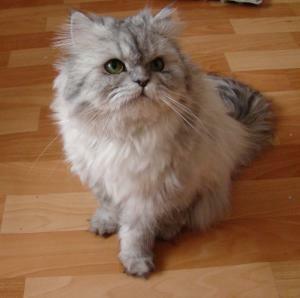 Any weight loss in older cats should be evaluated by a veterinarian as this could be a sign of many serious conditions. If your cat does lose weight through Hyperthyroidism, you will probably first notice muscle wastage along the spine. A loss of muscle mass may also be evident on the legs and underside. If the condition is left untreated, your cat may experience severe muscle wasting and emaciation, and this can be fatal. Even if your cat displays no other symptoms, it is very important to explain any weight changes to your vet, especially if your cat appears to be eating more than usual and is still losing weight. Along with increased appetite, most cats with regular Hyperthyroidism will display increased thirst (polydispsia) and will therefore urinate more frequently (polyuria). Cats are notoriously bad at drinking water, which is why they need to get most of their hydration from their food. If you notice your cat is drinking more than usual, don't overlook this important change. As mentioned already, high concentrations of circulating hormone can interact with and stimulate the CNS, which commonly causes cats to become hyperactive or intensely nervous. Cats with severe Hyperthyroidism are likely to twitch, tremble and/or have a frantic facial expression. This behaviour tends to intensify at night when affected cats become incredibly anxious and may yowl and pace. Cats with disturbed sleep patterns will sleep more during the day and will be strangely lethargic and drowsy. Extreme cases of Hyperthyroidism may prompt heart palpitations and difficulty breathing, with cats at rest panting for no apparent reason. If the condition is advanced, respiratory problems are much more likely and cats will exhibit difficulty and discomfort in breathing even in cool climates. Some cats with Hyperthyroidism will groom themselves excessively, causing baldness and dermatitis. The condition of the coat may also change for the worse, losing its shine and appearance. In cats with advanced Hyperthyroidism, excessive nail growth is another symptom to be aware of. If the nails grow quickly and appear thickened or more fragile, Hyperthyroidism may be the cause. Lastly, cats with Hyperthyroidism are like to have diarrhoea, loose, or excessive amounts of stools. A third of cats with Hyperthyroidism will frequently defecate and will also urinate more often. This is in keeping with their increased hunger and thirst. Some cats may even vomit after eating (particularly common in cats in multi-cat households) as they rapidly eat to compensate for their heightened metabolism. To help avoid this complication, try to feed your cat smaller amounts more frequently (every 3-4 hours) to prevent your cat from gorging on food until the stomach is uncomfortably full. Here, Jeanette Gallie shares her experiences of feline hyperthyroidism and her decision to opt for radioactive iodine treatment. "Last year, my 12-year old Devon Rex cat started losing weight - she was just skin and bones - yet her appetite had increased. She vomited frequently and pooped at least 4 times a day. Her breathing was also a lot faster. A blood test at my local vets confirmed hyperthyroidism. I had 3 options: 1) Medication 2) Radioactive iodine treatment 3) Prescription diet. Medication and the prescription diet don't cure hyperthyroidism, they only manage it. Radioactive iodine cures it, but the thought of Molly being radioactive scared me, and the side-effects of the medication also worried me, so I chose the Hills Prescription Diet Y/D. I bought both wet and dry food. It took a week to fully change her to it and by the end of the week, she became really ill. She couldn't keep any of the food down and had to be put on a drip. The vet told us it wasn't looking good for her, but not to give up hope. She was sent home and I took her off the Y/D diet and put some of her usual food in my hand. She could barely lift her head, but she licked some of the food. That was the start of her coming back from the brink. Molly had a check-up again after a few days and the vet said she could refer her to the hyperthyroid cat centre in Wetherby for the radio iodine treatment. It would cost roughly £2,000. We agreed. Within 2 weeks we had a lot of literature sent to us and consent forms to fill out, and off she went. She had the iodine injection just under the skin, which only takes a couple of minutes, and she was then isolated at the centre for 2 weeks because she was radioactive. We had daily phone calls and the odd photo of her while she was gone then, when she came home, we had to keep her confined to our spare room for 2 weeks. We were able to stroke her periodically throughout the day, but couldn't let her out. She had a check-up at the vets a fortnight later and the tests all confirmed she was cured. Her thyroid levels were normal. Being away from home then confined to one room did affect her psychologically and she became a bit withdrawn for a while, but it didn't last. It was a stressful experience, but looking at her now, it was worth it. I hope my experience will help someone facing the same dilemma." Our cat was 18 when diagnosed with hyperthyroidism. The vet discovered the condition on a yearly routine check-up. Our cat has never eaten a lot, has always been quite thin and we thought her wobbly back legs was arthritis, so hyperthyroidism is difficult to recognise. She is on cream now which is put on the tips of her ears night and morning and this works very well. Tablets frightened her and she got a bit bored with the food! Very, very helpful article. I have just lost a much loved cat to this illness so will certainly keep an eye on my other four. My cat was diagnosed 2 years ago. In May he developed Congestive Heart Failure CHF. He is now 17 1/2 years old. I started him with cream in the ears. The question from different vets is, how much of the medication does the cat really absorb. My advise would be, even though your cat maybe doing well, keep on top of the disease by having the blood checked every 3 months or so even if they don't need it. There may be changes going on and blood work is the only way to tell if you should increase medication or not. My cat didn't show any signs that the disease was progressing until it was almost too late. I was using the cream for 14 months, Then my cat started scratching around his neck and loosing hair. I think if I had done early blood checks, I could've saved him from the on set CHF. There is also surgery to remove the thyroid. I have a friend who did this for his 10 year old cat. It cost him about 170.00 pounds and his cat is doing just fine. My cat wasn't a canidate for this. There is "The Hyperthyroid Cat Center" in Yorkshire. This is the best plan possible I'm told of killing the disease. It cost about 2,000 pounds and is a one time treatment that works well. Once again my cat wasn't a candiate for this either. So, I too tried the Hills Science Diet Y/D and it is a good idea but in my opinion not worth it. My guy wouldn't eat it. Until Hills makes the food taste better, I'm afriad it is really a waste of money, but try it if you have to for the cat's sake. On occasion, when my cat won't eat anything, I ordered Hills Kitten Moussse in a can. He seemed to like it. As long as I can get him to eat. I also purchased a book on line called "Tanya's Comprehensive Guide to Feline Chronic Kidney Disease" even though he didn't have kidney disease the book talks about Hyperthyroidism and is very informative, but I like to read up on different stuff like this. It helped me. I'm in despair with my poor cat. He varies from ravenous to uninterested in food so getting the tablet down him is hopelessly hard. Your article talks of muscle wastage - helpful, as I didn't think of this as an explanation as why he now rarely jumps and if he does, often falls back. Interested re Clairpat's mention of a cream. Will check that out with my vet. which you wrap the pill in so she thinks she is having a chicken flavoured snack. Her condition has stabilized now. My cat Sammi is 14 and she came down with hyperthyroidism last July. Since being on a tablet twice a day she is back to the weight she was before she was diagnosed with it. Since my entry last Sept 2014, my old guy passed on Feb 11 2015. It's been hard ever since, but I know time heals. My cat Polly was diagnosed hyperthyroid in Nov 13. I was given the choice of tablets or the possibility of the food. Tried the tablets but she was spaced on the 1.25mg felimizole and looked so ill. She weighed 2.7kg at that point. Her T4 was over 309 (off the scale). I looked on the internet and found the Radioiodine I131 injection and knew instantly it was for Polly but thought its too good to be true and only in America. Thankfully we have the clinics in the uk too :) after contacting several, Andrew Bodey at the Hyperthyroid cat center was the Human to answer my questions and speak personally to me about my cat. He went through every step and worked alongside myself and my vet who hadn't had a patient with this treatment before. She had her bloods and other tests before she went and days later we were greeted by Andrew and his team when we arrived after a long drive and he examined her. She weighed 2.3kg and was very poorly with the hyperthyroid. She had the injection and recovered well in the 10 days she stayed (its more like a high class cattery) holiday spa. I got a call and updated everyday on her daily dooings and even on her first day home i could see the difference, within a few weeks she had put a great deal of weight on and at the 6 month weigh in her weight had gone from 2.3kg to 4.8kg. Her liver alt was 950 down to normal, heart rate had gone from 270bpm to 145bpm within weeks and she was cured. I wouldn't waste my time on the food or tablets and go straight for the Radioiodine if possible. Im sure it might have a purpose in short experiments to check kidney levels in cats that cant handle the tablets. I have 6 cats and wouldnt hesitate in doing the Radioiodine at Wetherby again. My cat will not eat pills even if wrapped in tasty treats, so I use the cream which is inside a syringe and goes right inside her ear, she is suspicious but cannot quite work out what I am doing. This has put some weight back on her. you should wear rubber gloves to be on the safe side. My female moggy aged 14 was diagnosed before christmas with a over active thyroid glad. She was always quite thin but noticed eating more and getting thin but the pacing especially at night like she could not rest. At the vets i was offered tablets we tried these (2 different lots at separate times) these made her very ill to the fact she was voimting blood and getting a lot thinner. In the end she had a small operation to remove the glad that was causing the problem. She is now putting on weight and sleeping more acting like she should. It is not a cure and could come back in months or even years but at the moment she is ok, and if it does we will deal with it then. Quite a fighting thing to deal with. Another good reason to get your pets insure as the whole process cost around Â£850.00. I sadly lost my lovely cat Willow to this disease 2 years ago. She was 16 and was on daily medication for approximately 3 years. She had a benign tumour on her thyroid which grew to quite a size and we decided to have her operated on to remove it. She seemed to be picking up afterwards but sadly a week after she had a heart attack and we lost her It was all too much for her. Still miss her so much. I now wish I had gone ahead with the radioiodine injection after reading the comments on this. I was given that option when Willow was diagnosed but it was so expensive and thought she would be fine on the tablets but sadly not. If I could turn the clock back I would not hesitate and would advise anybody to go for the radioiodine injection. I only wish I had, maybe Willow would have lived a better life in her last few years. I have now rescued a tortie, Tammy, she looks so much like Willow which is a comfort and if she shows any signs of hyperthyroidism, fingers crossed she doesn't, it'll definitely be the injection for her. My little 10yr old Daisy has lost a lot of weight very suddenly and is breathing very fast but otherwise no other symptoms and seems well and happy. She is having blood tests tomorrow; T4 and kidney function as my vet strongly suspects hyperthyroidism. I'm dreading the results and the associated ongoing cost. I love her very much and can't bear to see her so thin when she's always been such a chubby gir,l but I really don't have much disposable income at all! I therefore need to find the best treatment for Daisy but also, sadly, the most cost effective. Any advice on expected long term costs of the different treatments will be gratefully received. Thank you.